Today I had to help setup a cyberbike for the nintendo wii, so here’s my opinion on it. 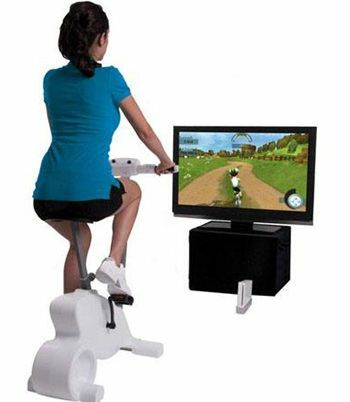 The bike seems pretty study, the body is made of white plastic to as a guess match the wii, on the handlebars are thumb sticks and different buttons, these work as a gamecube controller. The bike connects with a cable from the front of the bike to the 1st gamecube controller connector on the wii. The game itself that comes with it loaded up all ok, you then have to setup a profile, this is where some problems started, after you have setup your basic profile you have to set your pedaling strength, you have to pedal for 20+ secs, but we noticed pedaling wasn’t showing up on the screen, tried again but no luck, restarted game and set wii controller as main control, but still no joy, the manual for the game itself doesn’t even say anything about the bike as a controller, after a quick check in the photocopied bike manual, there is a switch on the handlebars that has gc or sb on, the bike was setup to gamecube controller mode, change the switch reset game and all ok. The game itself has mainly to modes a story mode and exercise mode, the story mode gives you different challenges to do in the four separate worlds, they are submarine, normal bike, helicopter, and a mine cart, well these are my explanations of the worlds. the exercise mode you choose your type,time ,world, difficult and then play. You get a on screen display depending on mode of your time, distance, speed and calories burnt, we played around with a few modes over about 30mins and some did seem fun to play. The different modes are pretty good using the bike handlebars to steer and the more faster you pedal the bike the faster you go on the screen. The bike to be honest is not that comfortable to sit on and if you not wearing trainers or some footwear can hurt the bottom of your feet and because of no pedal straps you feet can easily come off the pedals. Even with the problems with the setup of the bike and the slight problems with seat and pedal that could be over come with a cushion and some straps, think this is a fun exercise bike, as you get great interaction from the different on screen games, and at just under £100 from argos (home order only) not a bad buy if you have a wii and are looking for a fun exercise bike / game. But if you are just looking for a normal exercise bike there are probably better made ones out there. But because this uses fun games gives you more of an incentive to use it. I have found the instruction manual for the cyberbike you can download from my downloads section HERE, this is a copy of the original instructions, so copyright belongs to the manufacturer of the cyberbike and not myself, this is useful if you have lost your original instructions. I now don’t have access to the cyberbike anymore, but if anyone still wants to leave comments or ask for help please do so and I may still be able to help or other people that read this article maybe able to help. Remember this exercise bike does connect to the gamecube connectors on the top of the original wii console, and that if you have the newer models from mid 2011 ie the the wii light, these cat time of writing this amendment came in blue. If you have the wii light then you cannot connect this version of the cyberbike, if you are not sure what version of wii you have, if the wii is standing upright ie the dvd slot is vertical look at the top of the wii if there is a flap with four round connectors then you can connect up if not you have the cut down wii light and you cant connect the cyberbike to it. Update: I now longer have access to the cyberbike for the wii, now the wii u is out, this article is just for reference. Make sure the bike is in cyberbike mode, this is a little switch under the main controls think says GC/CB you need it set to CB as this is cyberbike mode, the other is gamecube mode. how do you choose game cube controller on the screen? when i get to that part, i have no clue what to do because my wii handheld controller wont choose anything, and i dont know how to highlight the gamecube controller box choice on screen and then select. help!! It sound like the bike is setup correctly, so think is is your profile, delet profile in game and setup new one, and go though the calibration process, that should do it. My Cyberbike is working well but I have no info as to how to use the buttons and joysticks on the handlebars, other than ‘A’ and the brake, eg can I use one to levitate? And what are the others for? Thankyou to all those who have put how to get set up and start cos I was at a loss. Automorphe, I had the same problem as you so i set up another character and made sure that CB was chosen on the handle bars and GB as the console and then everything worked. Hope it does for u too. how to get it to work with mario kart? 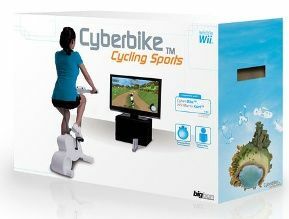 thinking of getting the cyber bike, but would like to know how long the connection lead is as my wii is on top of my tv? How do I find a replacement cable? Hello, I think I have more or less the same problem. I connected everything, and then I tried to press the start and programming buttons for 5 secs, but nothing happened. I disconnected it and then i tried it again, but it’s still not working. Hope you can help me. I am thinking about ordering a cyberbike and was wondering if there was a weight limit to the bike and if there is a weight limit, is there anything you can do to allow the bike to take someone heavier. I really like the look of the bike nd the game, but am hoping someone has the answers to my questions. the official weight limit is 95kg, but assume could take a few more kg’s, as i don’t have the cyberbike to look at if i remember right the main seat support is metal, but the main part that sits on the floor is a plastic shell, so not 100% sure if could be strengthened. I have been using the bike doing the story line but I now want to go onto the cyclocopter etc but it does not register any scores. My son originally set up the bike for me and I have had no problems whilst doing the one where you collect all the rubbish through the village etc. On the screen it show a + button to navigate but where is this. Hi, I am having issues with my cyberbike, most of the buttons work (sometimes) I have to keep pressing the programming and start button in hope that it will work. The pedals don’t respond really. Everythings set up correctly. first sorry for delay in replying to comments has i have had problems with my commenting system. @sheila – I not sure on the scores on some of the games the person i set this bike up for, did have similar problems with registering the scores on some of the game modes. If anyones else reading this has other answers please leave a comment, as this bike was setup for my mom, so do have full access to check some of the problems stated. Hi all, many thanks Kevin for the instructions. I just bought a s/h Cyberbike and I didn’t realise that (although the switch was set to CB=Cyberbike) that the *onscreen* setting had to be set to Gamecube. So that helped me a great deal. The person I bought the bike off had thrown away the bike manual. Does anyone have a copy I can download or as a pdf of the most important pages ? I would be happy to pay a few ££ for a copy. hi we have a cyber bike kids love it, but your darling puppy decided to chew the wire frim bike to wii, can i get a replacement if so were? The ninepin end of this cable is very fragile and mine is now damaged. I have tried contacting BigBen but no response. Has anyone managed to find a replacement cable? OK, after I made myself a new Licence and tried the Solo race, the Cyberbike, although connected properly, did not seem to work with Mario Kart. So half way through the race, whilst I was still on the startline, I pressed the + button on the remote, quit the game, and, in the menu, I could NOW select the various options / sections / games etc. using the buttons on the handlebars. So it looks like you need to start – quit – then restart it for the game to realise you are using the gamecube cable. Press the 2 button at the front (towards you) of the r.h. handlebar to go forwards, the 1 button at the back (away from you) to go backwards and pedal like mad. The steering is very sensitive so use it less than you would in the cyberbike’s own game. My first problem is that the light on handlebars doesnt come on. Ive tried holding ‘start’ and ‘program’ for 20 sec but it doesnt blink. The second problem is that the game controller option does not show as being available. Please could you spell out how to start from scratch? My problem is that in the instructions the manual says to connect the cables before inseting the handle to the base. What cables..!?! There is one already in there – connected to nothing, but the only other cable I have is to connect the wii to the bike. Hi I have just bought the blue wii an th cyerbike but when I went to connect the wire realised there was nothing for me to put the wire into on the wii. Is there a usb adapter instead? Thank goodness you put this on! I tried setting it up for my parents and failed miserably! No one ever answers the helpline and the instruction leaflet is next to useless!!! Fortunately my sister found this site and has now got it going – phew! I have recently bought a Big Ben cyberbike.It appeared to work fine,but now it doesn’t appear to steer.The bike on the screen just crashes to the left side ,regardless of the position and steering of the handlebars.We have checked all modes,switches,recalibration etc,has anyone got any ides ? I can’t find an answer anywhere,thanks. I have just brought a cyberbike and when i press the start button nothing lights up and I cant get started? Is there another way to change the resistance on the cyber bike? Ive got the resistance knob as far as it will go but its still not hard to pedal? Also my pedals feel like they need oiling but Im assuming I cant as it may go inside the plastic casing, any ideas? @lorraine: I don’t think it CAN be made harder. You can do what I do: attach two of those elastic straps with hooks on the end to the pedals and around the handlebar or seat – you need to make sure that the hooked ends can rotate easily otherwise they start to twist. Hi Kevin! I have problem with z cyberbike.I can’t start play cyberbike.C yberbike moves only on wii remote. Mario Kart moves easily.